I can't do the fair without a hot dog, a Coke, and a squirt of yellow mustard. I'm always thrilled to get through that gate in the snow fence into the world of the county fair. Stepping around kids, over manure, and past melting ice cream, I visit every stall in every barn. Having no sense of smell may fuel my enthusiasm, but I savor every sheep, goat, rabbit, horse and swine. If I can manage it without too many odd looks, I visit the petting zoo. Too bad my kids are so old now! A small fair, like my favorite in Ontario County, is real people baking and making, growing and showing, living real lives in real communities. I look over all their work, whether I know them or not, and applaud enthusiastically when their kids get awards. I'm also one of those oddballs who seriously studies booths set up by conservation districts, sheriffs' departments, fire companies, cooperative extension, alcoholism counselors, youth organizations, churches-my neighbors, giving sacrificially to help me build a better life. This fair is a shopper's paradise. I don't want a feed trough or a salt lick, but I drool over the sap evaporators. A fair has food, expensive, and mostly not good for me, but I can't do the fair without a hot dog, a Coke, and a squirt of yellow mustard. Strolling in detached amusement through the midway (all my money goes to hot dogs), I tremble with anticipation before the Tilt-a-Whirl and the Scrambler. You may find them ridiculously tame, but I can't pass them up. Besides, if I took anything wilder, I couldn't enjoy my hot dogs. After dark, my legs drag as though they were slogging through water. My head turns slowly, slowly, as I sidle through the crowd, almost asleep while I gather up the family and ooze toward the car. My pockets are full of circulars, household hints, and giveaway pencils, pens, pads, rulers, bookmarks. My heart is full of the gaudiness and the grandeur of a community coming together to show itself off and to build people up. And my stomach is full of hot dogs. With a squirt of yellow mustard. Allegany County: July 14-19, Angelica. 585-593-1180. Cattaraugus County: July 28-Aug. 3 , Little Valley. 800-331-0543. Chemung County: July 29-Aug. 3, Horseheads. 800-627-5892. Genesee County: July 15-19, Batavia. 800-622-2686. Monroe County: July 9-13, Dome Arena, Henrietta. 585-334-4000. 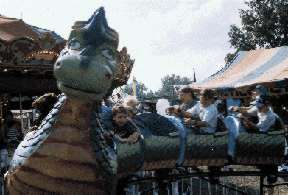 New York State Fair: Aug. 21 - Sept. 1, Syracuse. 800-475-FAIR. Niagara County: Youth Fair, Aug., Lockport fairgrounds. 716-433-8839. Ontario County: July 21-26, Canandaigua fairgrounds. 585-394-4987. Orleans County: 4-H Junior Fair, July 21-26, Knowlesville. 585-798-4265. Schuyler County: Youth Fair July, Watkins Glen. Seneca County: July 16-20, Waterloo fairgrounds. 315-539-9140. Steuben County: Aug. 11-16, Oldest continuously running county fair in the country, Bath. 607-776-7122. Wayne County: Aug. 11-16, Palmyra. 315-597-5372. Wyoming County: Aug. 9-16, Pike. 585-493-5626. Yates County: July 15-20, Penn Yan. 800-868-9283.